The wiretap channel considered in the seminal paper  is the first example that demonstrates the possibility of secure communications at the physical layer. It is shown in  that a source can transmit a message at a positive (secrecy) rate to a destination in such a way that an eavesdropper only gathers information at a negligible rate, when the source-to-eavesdropper channel is a degraded version of the source-to-destination channel, the source-to-eavesdropper and source-to-destination channels will hereafter be referred to as eavesdropper and destination channels, respectively. A similar result for the Gaussian wiretap channel is provided in . The work in  further removes the degraded wiretap channel restriction showing that positive secrecy capacity is possible if the destination channel is "more capable" ("less noisy" for a full extension of the rate region in ) than the eavesdropper's channel. Recently, there has been a flurry of interest in extending these early results to more sophisticated channel models, including fading wiretap channels, multiinput multi-output (MIMO) wiretap channels, multiple-access wiretap channels, broadcast wiretap channels, and relay wiretap channels. We do not attempt to provide a comprehensive summary of all recent developments but highlight only those results that are most relevant to the present work. We refer interested readers to the introduction and reference list of  for a concise and extensive overview of recent works. When the destination and eavesdropper channels experience independent fading, the strict requirement of having a more capable destination channel for positive secrecy capacity can be loosened. This is due to the simple observation that the destination channel may be more capable than the eavesdropper's channel under some fading realizations, even if the destination is not more capable than the eavesdropper on average. Hence, if the channel state information (CSI) of both the destination and eavesdropper channels is available at the source, it is shown in [4, 5] that a positive secrecy capacity can be achieved by means of appropriate power control at the source. The key idea is to opportunistically transmit only during those fading realizations for which the destination channel is more capable . For block-ergodic fading, it is also shown in  (see also ) that a positive secrecy capacity can be achieved with a variable-rate transmission scheme without any eavesdropper CSI available at the source. When the source, destination, and eavesdropper have multiple antennas, the resulting channel is known as a MIMO wiretap channel (see [8–12]), which may also have positive secrecy capacity. Since the MIMO wiretap channel is not degraded, the characterization of its secrecy capacity is not straightforward. For instance, the secrecy capacity of the MIMO wiretap channel is characterized in  as the saddle point of a minimax problem, while an alternative characterization based on a recent result for multiantenna broadcast channels is provided in . Interestingly all characterizations point to the fact that the capacity achieving scheme is one that transmits only in the directions in which the destination channel is more capable than the eavesdropper's channel. Obviously, this is only possible when the destination and eavesdropper CSI is available at the source. It is shown in  that if the individual channels from antennas to antennas suffer from independent Rayleigh fading, and the respective ratios of the numbers of source and destination antennas to that of eavesdropper antennas are larger than certain fixed values, then the secrecy capacity is positive with probability one when the numbers of source, destination, and eavesdropper antennas become very large. As discussed above, the availability of destination (and eavesdropper) CSI at the source is an implicit requirement for positive secrecy capacity in the fading and MIMO wiretap channels. Thus, an authenticated feedback channel is needed to send the CSI from the destination back to the source. In [5, 7], this feedback channel is assumed to be public, and hence the destination CSI is also available to the eavesdropper. In addition, it is assumed that the eavesdropper knows its own CSI. With the availability of a feedback channel, if the objective of having the source send secret information to the destination is relaxed to distilling a secret key shared between the source and destination, it is shown in  that a positive key rate is achievable when the destination and eavesdropper channels are two conditionally independent (given the source input symbols) memoryless binary channels, even if the destination channel is not more capable than the eavesdropper's channel. This notion of secret sharing is formalized in  based on the concept of common randomness between the source and destination. Assuming the availability of an interactive, authenticated public channel with unlimited capacity between the source and destination  suggests two different system models, called the "source model with wiretapper" (SW) and the "channel model with wiretapper" (CW). The CW model is similar to the (discrete memoryless) wiretap channel model that we have discussed before. The SW model differs in that the random symbols observed at the source, destination, and eavesdropper are realizations of a discrete memoryless source with multiple components. Both SW and CW models have been extended to the case of secret sharing among multiple terminals, with the possibility of some terminals acting as helpers [15–17]. Key capacities have been obtained for the two special cases in which the eavesdropper's channel is a degraded version of the destination channel and in which the destination and eavesdropper channels are conditionally independent [13, 14]. Similar results have been derived for multiterminal secret sharing [16, 17], with the two special cases above subsumed by the more general condition that the terminal symbols form a Markov chain on a tree. Authentication of the public channel can be achieved by the use of an initial short key and then a small portion of the subsequent shared secret message . A detailed study of secret sharing over an unauthenticated public channel is given in [19–21]. Other approaches to employ feedback have also been recently considered [22–24]. In particular, it is shown in  that positive secrecy capacity can be achieved for the modulo-additive discrete memoryless wiretap channel and the modulo- channel if the destination is allowed to send signals back to the source over the same wiretap channel and both terminals can operate in full-duplex manner. In fact, for the former channel, the secrecy capacity is the same as the capacity of such a channel in the absence of the eavesdropper. In this paper, we consider secret sharing over a fast-fading MIMO wiretap channel. Thus, we are interested in the CW model of  with memoryless conditionally independent destination and eavesdropper channels and continuous channel alphabets. We provide an extension of the key capacity result in  for this case to include continuous channel alphabets (Theorem 1). Using this result, we obtain the key capacity of the fast-fading MIMO wiretap channel (Section 3). Our result indicates that the key capacity is always positive, no matter how large the channel gain of the eavesdropper's channel is; in addition this holds even if the destination and eavesdropper CSI is available only at the destination and eavesdropper, respectively. Of course, the availability of the public channel implies that the destination CSI could be fed back to the source. However, due to the restrictions imposed on the secret-sharing strategies (see Section 2), only causal feedback is allowed, and thus any destination CSI available at source is "outdated." This does not turn out to be a problem since, unlike the approaches mentioned above, the source does not use the CSI to avoid sending secret information when the destination is not more capable than the eavesdropper's channel. As a matter of fact, the fading process of the destination channel provides a significant part of the common randomness from which the source and the destination distill a secret key. This fact is readily obtained from the alternative achievability proof given in Section 4. We note that [25, 26] consider the problem key generation from common randomness over wiretap channels and exploit a Wyner-Ziv coding scheme to limit the amount of information conveyed from the source to the destination via the wiretap channel. Unlike these previous works, we only employ Wyner-Ziv coding to quantize the destination channel outputs. Our code construction still relies on a public channel with unlimited capacity to achieve the key capacity. Finally, we also investigate the limiting value of the key capacity under three asymptotic scenarios. In the first scenario, the transmission power of the source becomes asymptotically high (Corollary 1). In the second scenario, the destination and eavesdropper have a large number of antennas (Corollary 2). In the third scenario, the gain advantage of the eavesdropper's channel becomes asymptotically large (Corollary 3). These three scenarios reveal two different effects of spatial dimensionality upon key capacity. In the first scenario, we show that the key capacity levels off as the power increases if the eavesdropper has no fewer antennas than the source. On the other hand, when the source has more antennas, the key capacity can increase without bound with the source power. In the second scenario, we show that the spatial dimensionality advantage that the eavesdropper has over the destination has exactly the same effect as the channel gain advantage of the eavesdropper. In the third scenario, we show that the limiting key capacity is positive only if the eavesdropper has fewer antennas than the source. The results in these scenarios confirm that spatial dimensionality can be used to combat the eavesdropper's gain advantage, which was already observed for the MIMO wiretap channel. Perhaps more surprisingly, this is achieved with neither the source nor destination needing any eavesdropper CSI. We consider the CW model of , and we recall its characteristics for completeness. We consider three terminals, namely, a source, a destination, and an eavesdropper. The source sends symbols from an alphabet . The destination and eavesdropper observe symbols belonging to alphabets and , respectively. Unlike in , , , and need not to be discrete. In fact, in Section 3 we will assume that they are multi-dimensional vector spaces over the complex field. The channel from the source to the destination and eavesdropper is assumed memoryless. A generic symbol sent by the source is denoted by and the corresponding symbols observed by the destination and eavesdropper are denoted by and , respectively. For notational convenience (and without loss of generality), we assume that are jointly continuous, and the channel is specified by the conditional probability density function (pdf) . In addition, we restrict ourselves to cases in which and are conditionally independent given , that is, , which is a reasonable model for symbols broadcast in a wireless medium. Hereafter, we drop the subscripts in pdfs whenever the concerned symbols are well specified by the arguments of the pdfs. We assume that an interactive, authenticated public channel with unlimited capacity is also available for communication between the source and destination. Here, interactive means that the channel is two-way and can be used multiple times, unlimited capacity means that it is noiseless and has infinite capacity, and public and authenticated mean that the eavesdropper can perfectly observe all communications over this channel but cannot tamper with the messages transmitted. We consider the class of permissible secret-sharing strategies suggested in . Consider time instants labeled by , respectively. The channel is used times during these time instants at . Set . The public channel is used for the other ( ) time instants. Before the secret-sharing process starts, the source and destination generate, respectively, independent random variable and . To simplify the notation, let represent a sequence of messages/symbols . Then a permissible strategy proceeds as follows. At time instant , the source sends message to the destination, and the destination sends message to the source. Both transmissions are carried over the public channel. At time instant for , the source sends the symbol to the channel. The destination and eavesdropper observe the corresponding symbols and . There is no message exchange via the public channel, that is, and are both null. At time instant for , the source sends message to the destination, and the destination sends message to the source. Both transmissions are carried over the public channel. At the end of the time instants, the source generates its secret key , and the destination generates its secret key , where and takes values from the same finite set . with probability one (w.p.1) for sufficiently large . The key capacity of a CW model with conditional pdf is given by . The case with discrete channel alphabets is established in [14, Corollary 2 of Theorem 2], whose achievability proof (also the ones in [16, 17]) does not readily extend to continuous channel alphabets. Nevertheless the same single backward message strategy suggested in  is still applicable for continuous alphabets. That strategy uses time instants with for . That is, the source first sends symbols through the channel; after receiving these symbols, the destination feeds back a single message at the last time instant to the source over the public channel. A carefully structured Wyner-Ziv code can be employed to support this secret-sharing strategy. The detailed arguments are provided in the alternative achievability proof in Section 4. Here we outline an achievability argument based on the consideration of a conceptual wiretap channel from the destination back to the source and eavesdropper suggested in [13, Theorem 3]. First, assume the source sends a sequence of i.i.d. symbols , each distributed according to , over the wiretap channel. Suppose that . Because of the law of large numbers, we can assume that satisfies the power constraint (1) without loss of generality. Let and be the observations of the the destinations and eavesdropper, respectively. To transmit a sequence of symbols independent of , the destination sends back to the source via the public channel. This creates a conceptual memoryless wiretap channel from the destination with input symbol to the source in the presence of the eavesdropper, where the source observes while the eavesdropper observes . which is again due to independence between and , and the inequality on the last line follows from . Since is arbitrary, the key capacity is lower bounded by . The converse proof in  is directly applicable to continuous channel alphabets, provided that the average power constraint (1) can be incorporated into the arguments in [14, pp. 1129-1130]. This latter requirement is simplified by the additive and symmetric nature of the average power constraint [28, Section 3.6]. To avoid too much repetition, we outline below only the steps of the proof that are not directly available in [14, pp. 1129-1130]. where the last line is due to the fact that . models the gain advantage of the eavesdropper over the destination. Note that , , , and are independent. The wireless channel modeled by (14) is used times as the channel described in Section 2 with and . We assume that the uses of the wireless channel in (14) are i.i.d. so that the memoryless requirement of the channel is satisfied. Since and are included in the respective channel symbols observable by the destination and eavesdropper (i.e., and , resp. ), this model also implicitly assumes that the destination and eavesdropper have perfect CSI of their respective channels from the source. In practice, we can separate adjacent uses of the wireless channel by more than the coherence time of the channel to approximately ensure the i.i.d. channel use assumption. Training (known) symbols can be sent right before or after (within the channel coherence period) by the source so that the destination can acquire the required CSI. The eavesdropper may also use these training symbols to acquire the CSI of its own channel. If the CSI required at the destination is obtained in the way just described, then a unit of channel use includes the symbol together with the associated training symbols. However, as in , we do not count the power required to send the training symbols (cf. (1)). Moreover we note that the source (and also the eavesdropper) may get some information about the outdated CSI of the destination channel, because information about the destination channel CSI, up to the previous use, may be fed back to the source from the destination via the public channel. More specifically, at time instant , the source symbol is a function of the feedback message , which is in turn some function of the realizations of at time . We also note that neither the source nor destination has any eavesdropper CSI. Referring back to (14), these two facts imply that is independent of , , , and ; that is, the current source symbol is independent of the current channel state. As a result, the key capacity of the fast-fading wiretap channel described by (14) can be obtained by maximizing the conditional entropy . This maximization problem is solved below. To determine the key capacity, we need the following upper bound on the conditional entropy . The upper bound is achieved when is a circular-symmetric complex Gaussian random vector. The second inequality above is due to the concavity of the function over the set of positive definite symmetric matrices [30, 7.6.7], and the Jensen's inequality. To get the third inequality, observe that can be interpreted as the covariance of the estimation error of estimating by the conditional mean estimator . On the other hand, is the covariance of the estimation error of using the linear minimum mean squared error estimator instead. The inequality results from the fact that (i.e., is positive semidefinite)  and the inequality of if and are positive definite, and [30, , 7.7.4]. Suppose that is a circular-symmetric complex Gaussian random vector. For each , the conditional covariance of , conditioned on , is the same as the (unconditional) covariance of . Since is a circular-symmetric complex Gaussian random vector [29, Lemma 3] , so is conditioned on . Hence by [29, Lemma 2], the upper bound in (20) is achieved with , which also gives the upper bound in (21). That is, we can assume with no loss of generality. Then we have the following lemma, which suggests that the objective function in (23) is a concave function depending only on the eigenvalues of the covariance of . where the last equality is due to the matrix inversion formula. Substituting this result into the left-hand side of (25), we obtain the right-hand side of (24), and hence (25). To show concavity of , it suffices to consider only diagonal in . Note that the mapping is linear in . Also the mapping is matrix-concave in [32, Ex. 3.58]. Thus the composition theorem  gives that the mapping is matrix-concave in , since . Another use of the composite theorem together with the concavity of the function as mentioned in the proof of Lemma 1 shows that is concave in . Thus (25) implies that is also concave in . Hence it suffices to consider only those with zero mean in (23). Now define the constraint set . Lemma 2 implies that we can find the upper bound on by calculating , whose value is given by the next lemma. Since the elements of both and are i.i.d., is invariant to any permutation of its arguments. This means that is a symmetric function. By Lemma 2, is also concave in . Thus it is Schur-concave . Hence a Schur-minimal element (an element majorized by any another element) in maximizes . It is easy to check that is Schur-minimal in . Hence . where the identity for invertible [34, Theorem 18.1.1] has been used. where , and . Substituting this back into (16) and using the matrix inversion formula to simplify the resulting expression, we obtain the same expression on the first line of (28) for . Thus the upper bound in (28) is achievable with this choice of ; hence it is in fact the key capacity. In Figure 1, the key capacities of several fast-fading MIMO channels with different numbers of source, destination, and eavesdropper antennas are plotted against the source signal-to-noise ratio (SNR) , where . The channel gain advantage of the eavesdropper is set to . We observe that the key capacity levels off as increases in three of the four channels, except the case of , considered in Figure 1. It appears that the relative antenna dimensions determine the asymptotic behavior of the key capacity when the SNR is large. To more precisely study this behavior, we evaluate the limiting value of as the input power of the source becomes very large. To highlight the dependence of on , we use the notation . Key capacities of fast-fading MIMO wiretap channels with different numbers of source, destination, eavesdropper antennas. The eavesdropper's channel gain dB, and . Thus . It is not hard to check that for any , which implies that . Hence is increasing in . Since the elements of are continuously i.i.d., w.p.1. Thus the matrix (resp., ) is invertible w.p.1 when (resp., ). Hence Part of the lemma results from monotone convergence. where . From (37) and (38), it is clear that . From (38), it is clear that increases without bound in w.p.1; hence also increases without bound. Combining this fact with (43), we arrive at the conclusion of Part of the lemma. Part of the lemma verifies the observations shown in Figure 1 that the key capacity levels off as the SNR increases if the number of source antennas is no larger than that of eavesdropper antennas. When the source has more antennas, Part of the lemma suggests that the key capacity can grow without bound as increases similarly to a MIMO fading channel with capacity . Note that the matrix in the expression that defines is a projection matrix to the orthogonal complement of the column space of . Thus has the physical interpretation that the secret information is passed across the dimensions not observable by the eavesdropper. The most interesting aspect is that this mode of operation can be achieved even if neither the source nor the destination knows the channel matrix . 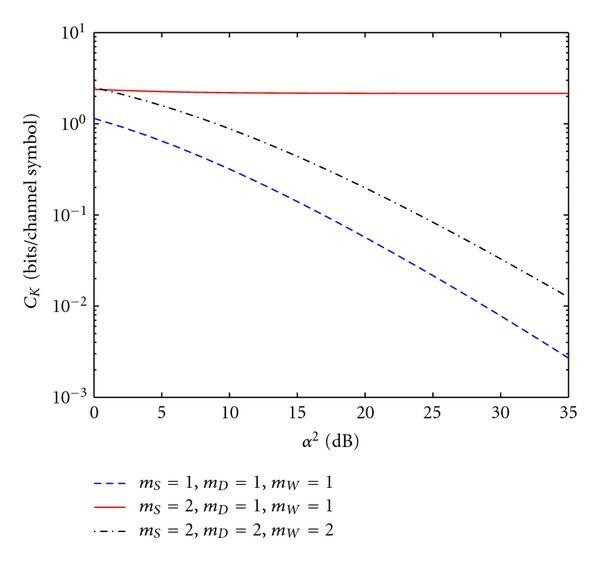 We note that the asymptotic behavior of the key capacity in the high SNR regime summarized in Corollary 1 is similar to the idea of secrecy degree of freedom introduced in . The subtle difference here is that no up-to-date CSI of the destination channel is needed at the source. Another interesting observation from Figure 1 is that for the case of , the source power seems to have little effect on the key capacity. A small amount of source power is enough to get close to the leveling key capacity of about bit per channel use. This observation is generalized below by Corollary 2, which characterizes the effect of spatial dimensionality of the destination and eavesdropper on the key capacity when the destination and eavesdropper both have a large number of antennas. This corollary is a direct consequence of the fact that and w.p.1, which is in turn due to the strong law of large numbers. Note that we can interpret the ratio as the spatial dimensionality advantage of the eavesdropper over the destination. 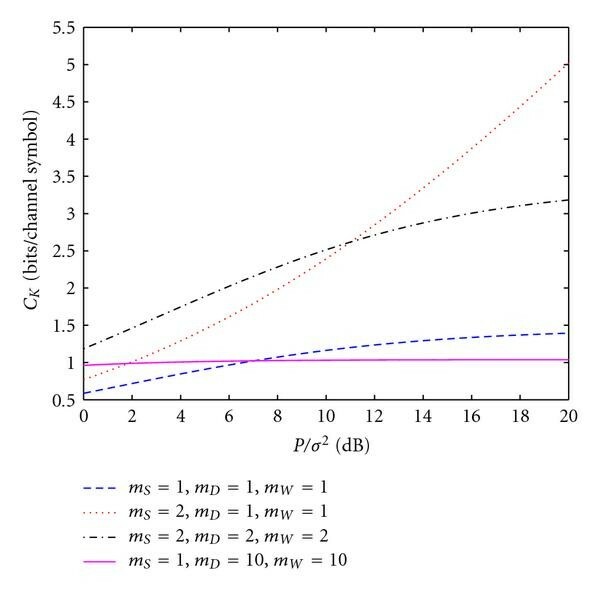 The expression for the limiting in the corollary clearly indicates that this spatial dimensionality advantage affects the key capacity in the same way as the channel gain advantage . In Figure 2, the key capacities of several fast-fading MIMO channels with different numbers of source, destination, and eavesdropper antennas are plotted against the eavesdropper's channel gain advantage , with dB. The results in Figure 2 show the other effect of spatial dimensionality. We observe that the key capacity decreases almost reciprocally with in the channels with and , but stays almost constant for the channel with . It seems that the relative numbers of source and eavesdropper antennas again play the main role in differentiating these two different behaviors of the key capacity. To verify that, we evaluate the limiting value of as the gain advantage of the eavesdropper becomes very large. To highlight the dependence of on , we use the notation . Key capacities of fast-fading MIMO wiretap channels with different numbers of source, destination, eavesdropper antennas. The source signal to noise ratio dB, where . Similar to the proof of Corollary 1. Similar to the case of large SNR, when the number of source antennas is larger than that of the eavesdropper's antennas, secret information can be passed across the dimensions not observable by the eavesdropper. This can be achieved with neither the source nor the destination knowing the channel matrix . the source exploits the information sent by the destination to reconstruct the destination's quantized sequence and uses the same binning scheme to generate its secret key. The secrecy of the resulting key is established by carefully structuring the binning scheme. For the memoryless wiretap channel specified by the joint pdf , consider the quadruple defined by the joint pdf with to be specified later. We assume that takes values in the alphabet . Given a sequence of elements unless otherwise specified. Similar notation and convention apply to all other sequences as well as their corresponding pdfs and conditional pdfs considered hereafter. Choose such that and , and let denote the corresponding marginal. Note that the existence of such can be assumed without loss of generality if and . If , there is nothing to prove. Similarly, if , the construction below can be trivially modified to show that is an achievable key rate. For each and , generate codewords according to . The set of codewords with forms a subcode denoted by . The union of all subcodes for and forms the code . For convenience, we denote the codewords in as , where for , , and . The code and its subcodes is revealed to the source, destination, and eavesdropper. In the following, we refer to a codeword or its index in interchangeably. Under this convention, the subcode are also the set that contains all the indices of its codewords. Denote and . where is distributed according to in the definition above. The source generates a random sequence distributed according to . If satisfies the average power constraint (1), the source sends through the channel. Otherwise, it ends the secret-sharing process. Since satisfies , the law of large numbers implies that the probability of the latter event can be made arbitrarily small by increasing . Hence we can assume below, with no loss of generality, that satisfies (1) and is sent by the source. This assumption helps to make the probability calculations in Section 4.3 less tedious. Upon reception of the sequence , the destination tries to quantize the received sequence. Let be the output of its quantizer. Specifically, if there is a unique sequence for some such that , then it sets the output of the quantizer to . If there is more than one such sequence, is set to be the smallest sequence index . If there is no such sequence, it sets . Let and be the unique indices such that . The index will be used as the key while the index is fed back to the source over the public channel, that is, . If , set and choose randomly over with uniform probabilities. After receiving the feedback information via the public channel, the source attempts to find a unique such that and . If there is such a unique , the source decodes . If there is no such sequence or more than one such sequence, the source sets . If , it sets . Finally, if , the source generates its key , such that . If , it sets . We also consider a fictitious receiver who observes the sequence and obtains both indices and via the public channel. This receiver sets if . Otherwise, it attempts to find a unique such that and . If there is such a unique , the source decodes . If there is no such sequence or more than one such sequence, the source sets . We use a random coding argument to establish the existence of a code with rates given by (46) such that and vanish in the limit of large block length . Without further clarification, we note that the probabilities of the events below, except otherwise stated, are over the joint distribution of the codebook , codewords, and all other random quantities involved. Before we proceed, we introduce the following lemma regarding the indicator function . If distributes according to , then for sufficiently large . If distributes according to , then for all . where the second inequality is due to that fact that for sufficiently large . where the last inequality is due to (50). Same as Part , interchanging the roles of and . Moreover we need to bound the probabilities of the following events pertaining to . When is sufficiently large, uniformly for all . When is sufficiently large, uniformly for all and . where the last inequality is due to Part of Lemma 4 since and are independent. where the first inequality is due to Part of Lemma 4, and the second inequality is from Part of Lemma 4 when is sufficiently large. Note that the same sufficiently large is enough to guarantee the validity of the lower bound above for all . uniformly for all and , when is sufficiently large. The third lower bound of (60) above is obtained from the inequality for any and positive integer . The fourth lower bound is in turn based on the inequality for and positive integer . where the equality on the fourth line is due to the i.i.d. nature of , the equality on the fifth line results from the fact that (since ), and the inequality on the second last line is from the definition of the indicator function . Note that the inequality on the third line of (65) results from upper bounds of and , which can be obtained in ways almost identical to the derivations in (62) and (63), respectively. The inequality on the fourth line is, on the other hand, due to Part of Lemma 5. By expurgating the random code ensemble, we obtain the following lemma. for sufficiently large . This implies that there must exist a satisfying , , and . Thus, Parts and are proved. for sufficiently large . Thus, Part is proved. In the remainder of the paper, we use a fixed code identified by Lemma 6. For convenience, we drop the conditioning on . Since can be chosen arbitrarily, Part of Lemma 6, (72), and (76), establish the achievability of the secret key rate . We evaluated the key capacity of the fast-fading MIMO wiretap channel. We found that spatial dimensionality provided by the use of multiple antennas at the source and destination can be employed to combat a channel-gain advantage of the eavesdropper over the destination. In particular if the source has more antennas than the eavesdropper, then the channel gain advantage of the eavesdropper can be completely overcome in the sense that the key capacity does not vanish when the eavesdropper channel gain advantage becomes asymptotically large. This is the most interesting observation of this paper, as no eavesdropper CSI is needed at the source or destination to achieve the non-vanishing key capacity. The work of T. F. Wong and J. M. Shea was supported in part by the National Science Foundation under Grant CNS-0626863 and by the Air Force Office of Scientific Research under Grant FA9550-07-10456. The authors would also like to thank Dr. Shlomo Shamai and the anonymous reviewers for their detailed comments and thoughtful suggestions. They are grateful to the reviewer who pointed out a significant oversight in the proof of Theorem 1 in the original version of the paper. They are also indebted to another reviewer who suggested the concavity argument in the proof of Lemma 2, which is much more elegant than the authors' original one.